Are your new year resolutions like waffles? Perhaps they should be! Admit it; despite years of failure, perhaps even decades of failure, you made a few New Year’s resolutions. You have a miserable track record, and yet, so optimistically you try again. You have a lot of company as 45% of us make resolutions. (See the numbers at statisticsbrain http://www.statisticbrain.com/new-years-resolution-statistics/. We line up a few old war horses, lose 10 pounds or eat healthier, perhaps we have more altruistic aspirations so we pledge to volunteer at a soup kitchen or mentor at the local school. Maybe this is the year for your personal achievement so you vow to sign up for French lessons, take up watercolor painting or write poetry. Well, it is now the second week of the New Year. How are those resolutions going? More than likely, not so well. University of Scranton research suggests as few as 8% actually achieve their goals. Frankly to me that sounds inflated. But one way to look at resolutions is to think of them like waffles. Everyone knows that the first waffle out of the iron is usually inferior. Many people routinely toss out that first waffle. I have even heard that “children are like waffles, the first one should be tossed out.” I am not ready to go that far . . . but I do think resolutions may fall into the waffle category. The first waffle fails because the iron isn’t quite ready. The surface may not be hot enough, or may be unevenly heated. The waffle ends up undercooked, or burned, or sometimes both in the same waffle! That first one is never as good as the second one. Resolutions are like that. You should make resolutions on January 1, give them a workout, and then revisit them a week or two later. How are they going? If you are already faltering, re-evaluate each resolution. Did you take a bigger bite of that waffle than you could chew? Did you make waffles when you really wanted steak and eggs? Did you make too many waffles and are now choking? So what does all this have to do with storytelling and your business? Here are 10 bite-sized resolutions to rev up your storytelling. You can’t do them all. The goal is to pick a few—or maybe just one—and actually do them! The goal is to take that first step on the road to storytelling. Develop a habit that you can build on. Repeat until you have an Unstoppable Brand with raving fans. Write, or revisit, your passion story. Does it demonstrate your passion? If not, then re-write it so it clearly shows your customers why you are really in this business. Based on your experience using it, perhaps now you can work on improving it. Read one good book on business storytelling. Take notes and find three action items you can do based on what you have learned. Read “The Hero and the Outlaw: Building Extraordinary Brands Through the Power of Archetypes” (or reread it) and really think about your archetype and what it means to your marketing and customer experience. Follow one blog or subscribe to one newsletter on business storytelling. At least once a month, implement an idea you learned. Develop a simple system to record customer story ideas so they are ready to use when you have time to write the story. Yellow sticky notes, moleskin notebook, backs of envelopes, old-fashioned corkboard or smart phone dictation app. It doesn’t make any difference what you use as long as you use the system and can find those ideas when you need them. Make a point to ask one customer each week (or each month) about their experience to see if it can be worked into a story. Be sure to put this on your calendar or it will never happen. If you are already doing story writing, this is the year to ramp up your writing style. Subscribe to a copywriting blog, read a book on writing or just read this one post and resolve to review everything you write against these principles. Take the Tiny Habits course. Visit http://tinyhabits.com/ the web site of BJ Fogg, PhD (what a great name!) of Stanford University and take his free 5 day course. Courses start each Monday. Where are the missing resolutions? Did you notice I promised 10 resolutions and only gave you eight? Why? Because none of these may work for you and only resolutions that you care about have any chance of success. Those missing two resolutions? You need to come up with those. What can you do this year? What will you do this year? 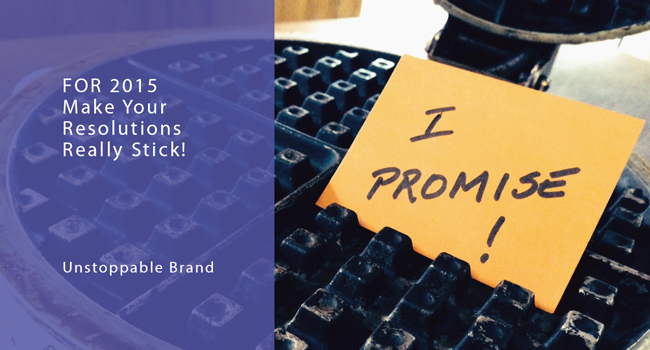 What resolutions will really make a difference in your business? Why not make yourself a batch of waffles, toss out the lousy first one, enjoy the rest, and get that New Year’s resolution list perfected. Need ideas on a good blog to follow or book to read? Have questions about your stories? Leave a comment and I will respond!